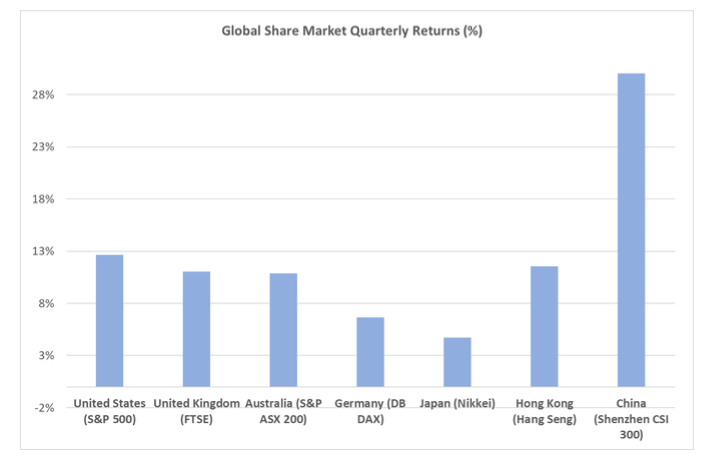 In the final quarter of 2018 global equites (hedged) fell 13.6% to deliver an annual return of negative 7.6%. The first quarter nearly reversed this fall with a healthy return of 12.6%. There were several factors supporting the rebound but undoubtably one of the most significant was the guidance given by Central Bankers that the threat of rising short-term interest rates was on hold. The US Fed (the US Central Bank) raised rates four times in 2018 and intimated more rate rises were to occur this year. However, in January it began to ease off on such rhetoric and in March implied rates were on hold for the rest of the year. Financial markets were heartened by the news and rallied accordingly. The US, the largest economy in the world and still growing soundly thanks in part to large corporate tax cuts introduced in 2018, saw the S&P 500 Index rise a solid 12.6% in the quarter. The benign outlook for interest rates along with a cooling off in the threat of the trade war worsening with China bolstered investor confidence. President Trump had been threatening to increase tariffs on over Us$ 200 billion of Chinese imports from the current 10% to 25% level from the 1st of March. The Chinese Shenzhen CSI 300 Index rallied nearly 18% in February alone on the expectation this would be avoided. Chinese market sentiment was also supported by ongoing domestic economic stimulus, with President Xi Jinping looking to quicken the pace of development of the domestic financial services industry. The Shenzhen CSI 300 (a Chinese equity benchmark) rose 30.2% for the quarter. In contrast, European economies have not been performing as well with recently released data showing that many barely grew in the second half of calendar 2018. Growth for the region as a whole was only 0.2% in the September and December quarters, the slowest quarterly growth rate in four years. Germany, Europe’s largest economy, had a flat December quarter, after a negative 0.2% the previous quarter, and hence averted a recession. Not so Italy, where a negative 0.2% growth in the final quarter confirmed the economy was in recession. The U.S. trade sanctions on Chinese imports appear to be having a second-round negative effect on European exports. Nonetheless, the German market was pushed higher (up 6.6% for the March quarter) off the back of the global equity rally. In the UK, the Brexit date came and went and still there is no clear path to exiting the EU and the impasse is now fracturing both major political parties. However, despite the Brexit uncertainty, the U.K. market also enjoyed a solid performance, rising 11.1% for the March quarter. Emerging markets were flatter than developed markets, despite China’s strength over the quarter. Headlines on South American markets were dominated by a tragic dam collapse in a Brazilian iron mine. Shares in Vale, the company operating the mine (who is also the world’s largest iron ore miner), fell 25% in the days following the dam collapse. US policy makers implied they would keep interest rates on hold for the year, in contrast with their December forecast for two rate hikes, as slowing global growth weighs on the US economy. Consequently U.S. 10-year Treasury Notes fell below three-month treasury bills for the first time since 2007. In Australia, 10-year bond yields hit a new record low of 1.73% in March to end the month at 1.78%. 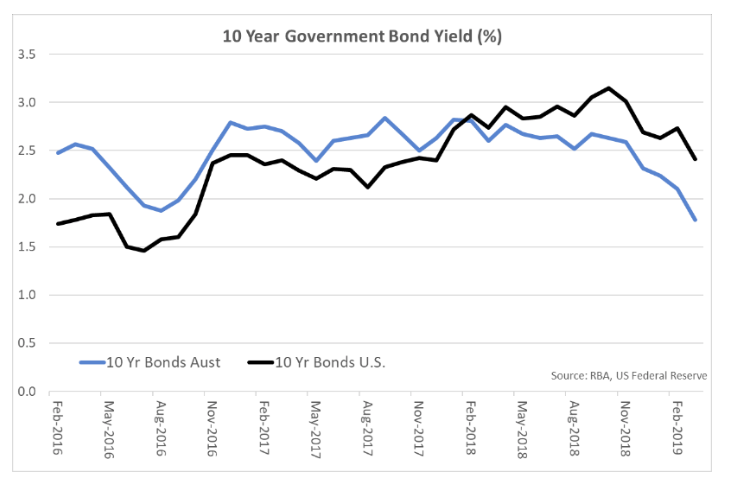 When bond yields fall, the price of bonds increases and as a result the fixed interest asset class delivered positive returns for the quarter. Half a percentage point of interest rate cuts by the Reserve Bank is now fully priced in by the futures market, which sees the cash rate at 1% by August 2020. Despite these expectations of lower interest rates in Australia, the $A remained relatively stable over the quarter, finishing at U.S. 70.9 cents after opening the quarter U.S. 70.6 cents. The Commonwealth Government’s Budget Statement in early April appears to have had little impact on financial markets. Although the swing from a deficit to surplus was newsworthy, the change was expected and the magnitude of any shift in fiscal policy was minimal. No doubt some policy changes will impact the fortunes of individual companies and investors, but from a macro-economic perspective there appeared to be few implications for equity, bond or currency markets. The experience of the last 6 months highlights the merits of maintaining a long term investment strategy and ignoring shorter term noise. 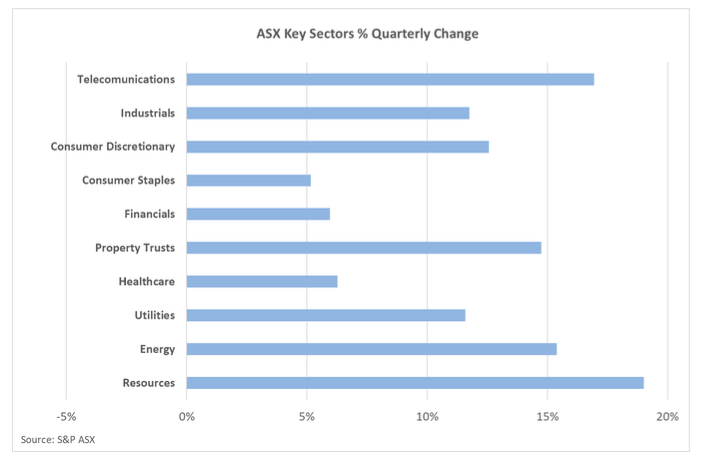 Panic selling amid the overwhelming negative sentiment of the December quarter would have resulted in investors missing the significant bounce back in share prices in the March quarter. 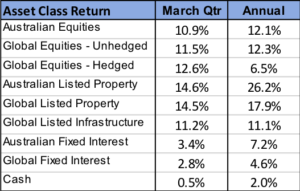 Importantly, over this six month period, there has been little change in underlying company profitability, which has remained strong and facilitated a general lift in dividend payouts. It is a focus on the sustainability of this underlying dividend flow that forms one of the key elements of the investment strategy at Navwealthand provides us with a longer term perspective from which to determine investment value. It is possible that the recent rally on share markets, and decline in bond yields, has been an over-reaction to a perceived change in central bank policy. If so, there may continue to be gyrations in valuations in the months ahead. Locally, the forthcoming Federal Government election may act as an additional source of uncertainty and volatility, resulting in short term noise and possible investor angst. What is unlikely to change, however, is the longer term investment fundamentals. We currently remain in a period of low interest rates, minimal cost pressures and rising revenue which in turn has continued to support company profitability. Ultimately, it is the persistence of this profitability that provides the means for long term wealth accumulation for investors.